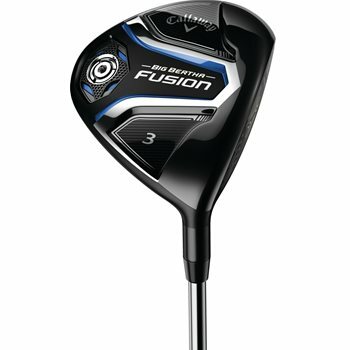 The Big Bertha Fusion fairway woods push the boundaries of forgiveness like no other Callaway wood ever has with its revolutionary design. The fairway woods feature an ultra-strong triaxial carbon and steel composition, designed to increase the clubs’ forgiveness on mishits because it raises the moment of inertia (MOI). To further improve the accuracy of off-center ball strikes, Callaway has strategically positioned weight into the perimeter of the club head to optimize the center of gravity. The Big Bertha Fusion fairway woods also feature Callaway’s Hyper Speed Face Cup, which generates high ball speeds across the entire face.